Do you believe in Guardian Angels ? Do you believe in Guardian Angels ? – well I do now I can tell you ! Living on one of the family islands here in the Bahamas means that we import pretty much everything – especially our cars. We have a couple of Honda Odyssey cars and they both only have one ignition key. Getting a spare ignition key is a terrible pantomime so most people here make do with the one…… So the other day at the end of a pretty frantic day rushing about between jobs I took off to French Leave Beach to give Rudge some much needed exercise. As always at that time of day I also took a bag with his supper in it – I feed him by hand a bit at a time – using it as a bribe to get him to come to call and it works ! Thanks to Todd Vendituoli for one decent picture of Rudge with his antlers in place ! Anyway for some bizarre reason I cannot recall I locked the car and took the key with me – I NEVER lock the car here !! It was around 5.30 pm and the sun had gone down when I got back to the car and discovered that I no longer had the key – oh shoot – or something similar ! I was convinced that I must have dropped it between parking the car and taking my shoes off to walk on the beach. So I walked backwards and forwards scanning the ground about 4 times. By this time I was nearly crying and my imagination was totally running riot – the car would stay there for weeks until I could get a new ignition system – it would cost a fortune blah blah blah – you know how it goes …… Then I thought – I must pull myself together – so I said out loud – OK my Guardian Angels – if you are out there – I REALLY need you to help me please – I know you have a lot to do but please help me…..
I’ve had quite enough of being dressed up thank you ! I decided to walk along the water line – which is usually where I walk – for a short way to calm myself down. And after about 200 yards – there was the key – half covered by sand which the tide had washed over it and soaking wet – but there it was ! 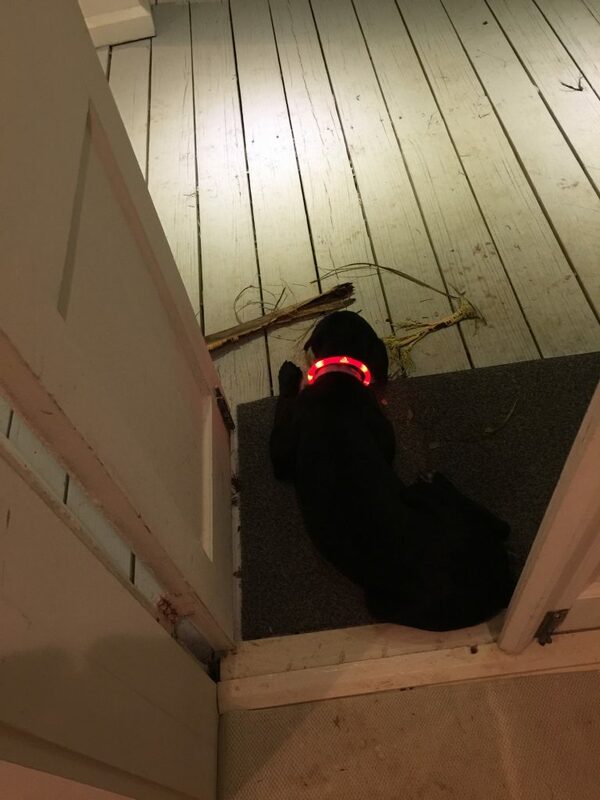 I laughed out loud – and thanked those spectacular Guardian Angels over and over again ….. For days it has stayed in my mind – the absolute joy of finding that key and the absolute gratitude that I feel for having been blessed in that way ……. So now maybe I will find a way of getting a second key even if it takes a long time and a lot of trouble – but in the meantime I once again thank my Guardian Angels. I think that I am a pretty logical and sensible person – but once in a while it is good for all of us to suspend rational thought and believe in miracles – minor and major – and what better time of year is there than now ? Thanks to Hans Febles for this lovely shot of the house ….. So with Christmas magic in the air once again we have decorated Colman Towers – it all starts off quite tastefully with some elegant artificial twiggy Christmas trees , then come the icicles all around the veranda – then we totally throw caution and good taste to the wind and install the 10 foot inflatable elephant with Santa on his back right on our front deck. 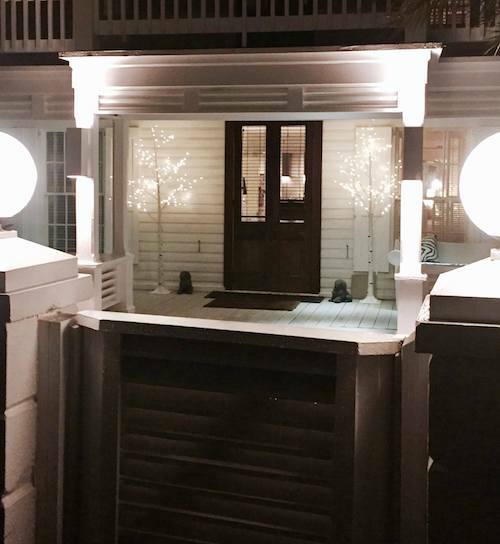 It is such fun because now all the local children ask their parents to drive them by the house to see the decorations. Santa on the elephant is the newest addition – but we also have Santa on his pirate ship and Santa in the helicopter as well ! 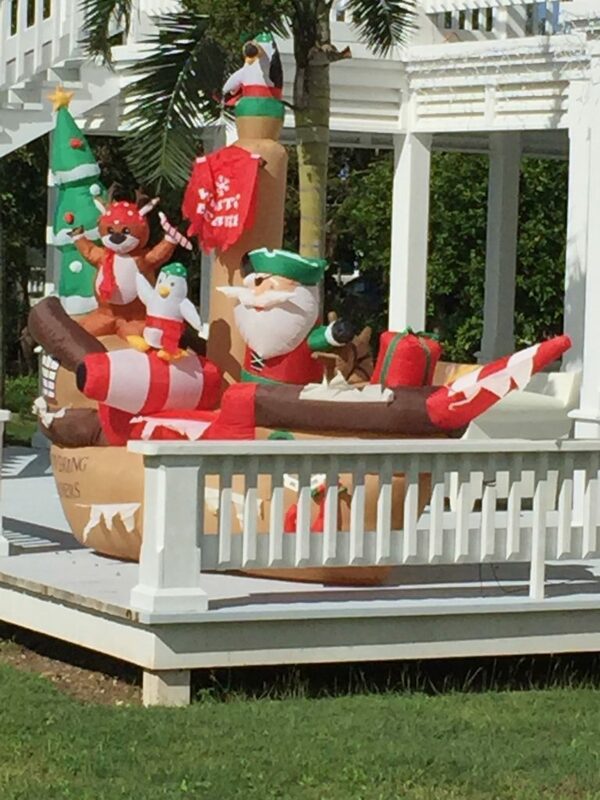 Inflatable pirate ship with Santa and helpers …. 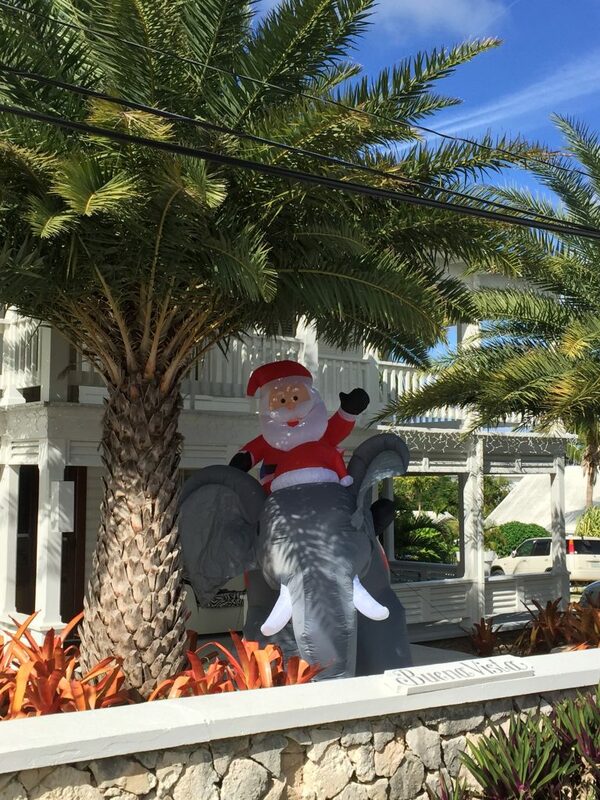 A very Happy Christmas to you all……..
We have had to move Nelly the elephant from the front veranda as the wind kept on getting her – she is now round the side of the house but hopefully still visible. Hope you have had a lovely Christmas…..
Merry Xmas & Blessed New Year to you & Bob and your family. TOPS is always in our hearts & thoughts. Especially with this cold spell. Xoxo to Rudge! Warmest regards, Susan, Judy and Joe from LI NY. Those among us who believe we were born under lucky stars are fortunate. Mom always said “your guardian angel will take care of you.” What a harrowing but gratifying experience to remind thee! Happy Christmas. Decorations look wonderful. If snowflakes were hugs I’d send a bunch. We have snow to spare…. This was the best Christmas message! Yes. Miracles do happen. I so enjoyed your story and the Santa photos. The house looks wonderful! I would love to hear back if you are receiving my messages? Thanks Camilla – yes your messages are getting through – lovely to hear from you. 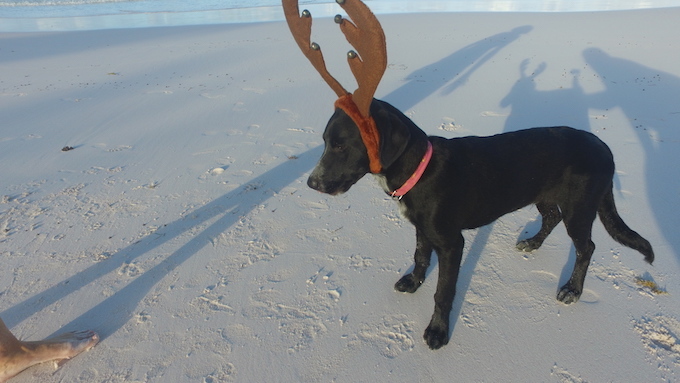 Hope you have had a good Christmas….